Ceremonial Hall 1 of the Library and Learning Center at the WU Vienna fell silent as the finalists of the IBA-VIAC CDRC VIENNA Mediation and Negotiation Competition 2018 took the stage last Friday afternoon. Nikita Garg and Kshitija Sharma representing National Law School of India University, Bangalore as well as Victoria Pankratova and Constantine Malyukov of MGIMO-University, Moscow along with mediator Sonia Anwar-Ahmed Martinez of SOAS University of London sat down at the negotiation table for a mediation case centered around a confidentiality breach between two international companies. 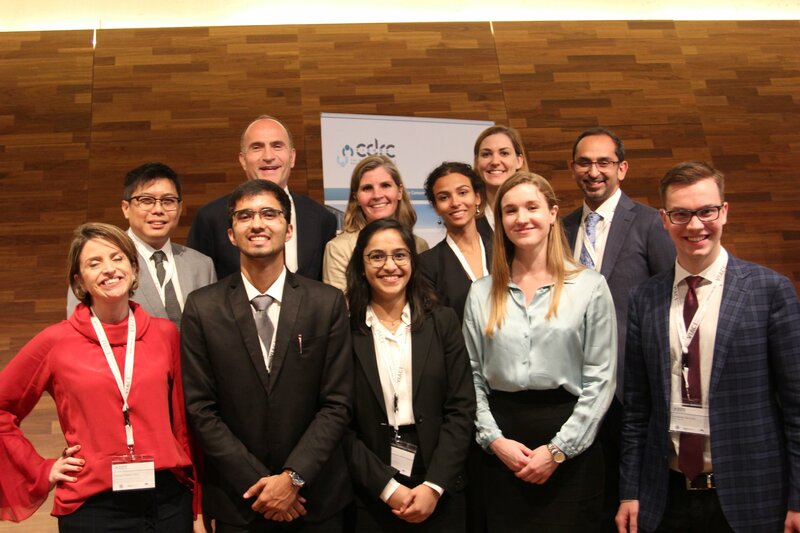 The five-person assessor team consisting of members from France, Pakistan, Brazil, Singapore and Austria – represented by our very own Bettina Knoetzl – followed the skillful arguments of the next generation of dispute resolution lawyers. The highly professional back and forth interaction between the teams under the lead of the mediator showed how much work and dedication these students put into the preparation for this competition with the goal to find a mutually beneficial solution – just like in real life. The winner was announced after the suspenseful 90-minute session was over: Nikita Garg and Kshitija Sharma – National Law School of India University, Bangalore. In closing, the assessors pointed out the strategic communication tools utilized by each team and praised their commitment to their side of the case. Competition Director Claudia Winkler concluded the event by inviting everyone to the award ceremony hosted by and at the office of KNOETZL. The participants gathered on our beautiful rooftop terrace just in time to witness a glorious sunset. Later that evening, the award ceremony once again honored the winning team, the runner up and the mediator. It was also a chance to thank Claudia Winkler for her hard and heartfelt work during the course of the competition. The students that came to Vienna from over 35 countries were able to celebrate their accomplishments and form friendships (and professional networks) for life before heading back home. A special thank you also to our Counsel Natascha Tunkel who was a member of the working group responsible for setting up the cases being negotiated. She has also been an expert assessor for this event in the past years and was part of the semi-finals assessor team this year. We also want to congratulate our Associate Sofiya Svinkovskaya who led the Vienna team to victory in the category Best Negotiation Strategy. We at KNOETZL were honored to be a part of it. See you next year! For more information and photos of the finale, click here. As neutrals, mediators and counsels, we combine business acumen with our extensive experience to resolve disputes on a win-win basis. Our insights into and understanding of the process help us develop cohesive strategies to achieve an optimal outcome. In many cases, mediation is the fastest and most cost-efficient means of dealing with a dispute. Our specialists are qualified as both lawyers and mediators. KNOETZL also offer top notch litigation and arbitration services. We are full-blooded dispute resolution lawyers with the richest tool kit available to achieve a favorable outcome for our clients.